I thought birthers were supposed to be crazy. 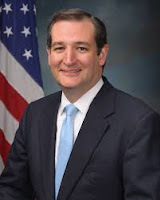 Florida Congressman Alan Grayson told radio host Alan Colmes Wednesday that if Ted Cruz is elected president, he “will file that beautiful lawsuit saying that he’s unqualified for the job” according to the Constitution. Cruz was born in Canada to a native-born American mother, making the presidential candidate a dual Canadian-American citizen. It was not until a 2013 Dallas Morning News article that Cruz acknowledged his Canadian citizenry publicly. In 2014, the senator renounced his Canadian citizenship altogether.